In a workshop on ‘Literature Searching’ for a group of DNB students I briefly explained the ‘Filters’ feature in PubMed. I gave an example of using this feature to locate ‘free full text’ articles. In this context a student remarked “Anyway 90% of articles in PubMed are not free, so this feature will not be of much use”. I sigh again, thinking – “PubMed’s role DOES NOT include providing free articles”. And several students / health professionals do not know this. 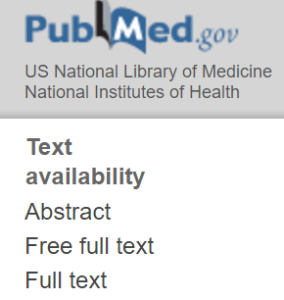 PubMed has been available free since 1997. That is nearly 20 years now. And yet, many health professionals (and automatically their students) have not fully understood what PubMed is – an index. PubMed’s role is to point out what is published on any topic, in several journals. The results are bibliographic records. PubMed is a database of such records and not a search engine that crawls journal websites. PubMed is actually being helpful by pointing out / filtering those that are available free. What do we mean by role / scope of a resource? If we look up a dictionary for the word ‘India’ we expect to find the meaning of India and we do not grumble that the dictionary does not contain thousands of exotic pictures of India. A Dictionary is not a resource for images (you may find a few, depending on the type of dictionary). For images you have image gallery resources like Pictures India, and Shutter Stock. Every resource has a scope, which explains the nature of the resource, what it covers and what it does not cover. In a print resource, you will find these details in the early pages. In an online resource it is usually in the “About us” section. Remember the scope and utility of PubMed. It does not contain journal articles. When you search PubMed you get results that tell you what is published on your search topic in journal articles. You get bibliographic details of articles indexed in PubMed. You may get a link to the full text, in the Publisher”s website (or in an archive). And it is up to the publisher to make it available free or otherwise.